Judging from the emails that you’re sending me (thanks! ), a large number of the readers and users of my blog and website are students. If you don’t have a smartphone, not to worry. There are plenty of internet sites that are pretty similar to these apps. Let’s see what’s new in the app market. That is to say, the apps themselves are shockingly unoriginal. The offerings include grammar, some vocab and a bit of Shakespeare for dummies. However, the good news is that the English apps that I’ve reviewed seem to be technically improving all the time. They’re faster, richer and easier to use. Indispensible (= you really need this). This app works in a straightforward way. You can look up a word, hear how it’s pronounced, and check its meaning. Plus, there are many example sentences! Example sentences are excellent for English learners because English has so many different words that it’s probably more important to know how to use a word than to know what it means. This app also has a cool Voice Search. That means that instead of typing the word that you’re looking for, you can also say it. Inevitably, the app slips up sometimes. What is bad about Dictionary is that the pronunciation is indicated in some goofy kind of phonetic “code.” If you look at the picture above, on the right screen, you’ll see that it says that “hello” is pronounced [gibberish]. It would be so much better if all dictionaries would just stick to the phonetic alphabet to “translate” pronunciation. It’s not so hard to learn, so what’s the problem? There are a couple of apps that let you rehearse words. Certain English tests, especially the ones that give you entry to college, require you to know the meaning of lots of words. Students who don’t have this knowledge naturally are looking for a shortcut and they end up cramming (= putting a lot of information in your head in a short time). Although I don’t recommend learning English in this way, I realize there is a need for that kind of practice. So here are two perfect apps that help you test your knowledge of individual words. Flashcards is great for a quick reviewing of academic words. Another iPhone app that is similar to the previous one. Are you starting to yawn already? Yeah, me too. 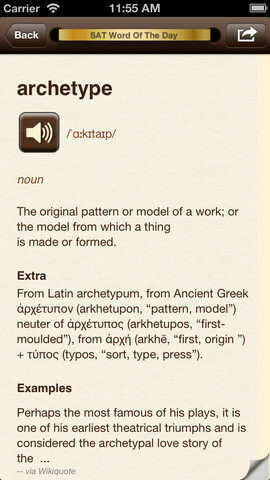 Vocabology looks more like a dictionary and the good thing about is that it gives you plenty of example sentences. Whether you’ll really like Vocabology depends on your purposes. Because there are entertaining words from Urban Dictionary (the popular website which has streetwise words and expressions) and it has a word of the day, it’s more of a fun app than Flashcards. 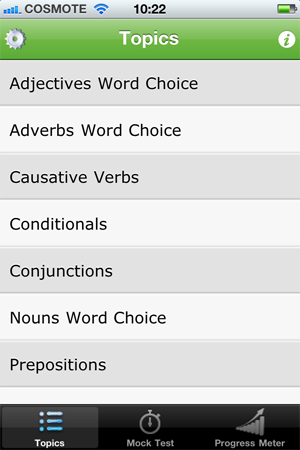 But Flashcards has more “exam words,” so if you need to sit for SAT or TOEFL then certainly I’d say go for Flashcards. This app is ideal for working people who need to quickly review their grammar. Because of the kind of language that’s being used it’s less suitable for the general student. Nice grammar quizzes. There is a free version with 10 categories; the full version has 20 categories, ranging from tenses, prepositions, to word choice. Explanations about the subjects of the quizzes are lacking. If you don’t have a clue what conditionals are, you’re going to be lost in a quiz about them. A library for iPhone where you can download books that are required reading at schools or at university, often for free. The app itself is free, too. As the proverb says: when the bow is strung too tensely, it’s easily broken. It’s impossible to learn and work all the time; you also need to relax. Listen to Wunder Radio. This nifty app lets you tune in to radio programmes which are sorted according to subject. Watch and read CNN. The short videos are of super high quality. iFitness. I’m not sure that exercise is relaxing, but for some people it might be! 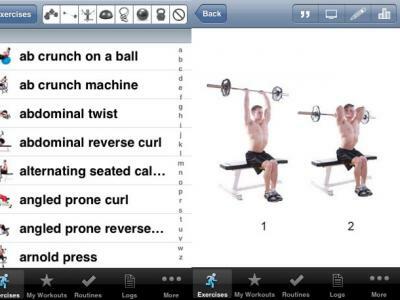 This app has hundreds of exercises with instructions and photos, and another hundred or so exercise videos. You can also calculate your BMI and use a stopwatch. There is a log with workouts where you can compare your workout from today to that of any other day. Browsing and trying all these apps has made me desirous of an app that doesn’t exist yet. – A good quotation app. There are some on the market (“Brilliant Quotes” for example) but they don’t have that many quotations. I would like an app that has thousands of quotations that can be searched by author and by subject. – Favourite sentences or paragraphs from literature app. There’s an app with brilliant first sentences, but that’s all. – Favourite video excerpts. Same thing as the literature app, but like an encyclopaedia of videos.